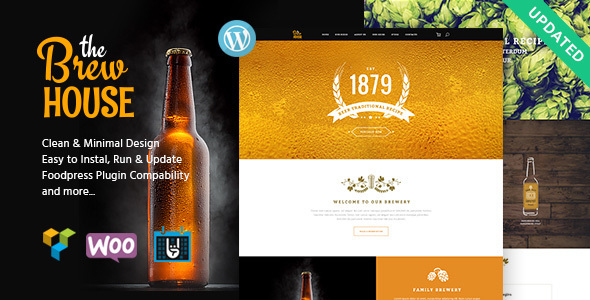 The Brew House – is a stylish Brewery WordPress Theme crafted for brewery, pub, cafe, bistro, bar, restaurant, beer fast, private brewery, vinery, family brewery, food blog & drinks blog. You can easily manage your online menu (including categorization, recipes, nutrition information etc) and table reservation. The Theme will also fit winery and if you brew beer. If you wish to sell goods via your website, you can make an online store based on WooCommerce plugin and full shop design integration. Or manage content with WPBakery (aka Visual Composer, which we think is better than Elementor). Besides, we have made the theme compatible with the cool FoodPress plugin allowing you to showcase your restaurant’s menu in a beautiful way. You can also accept reservations and bookings online due to the theme’s compatibility with the Booked! plugin. PLEASE, NOTE! FoodPress Plugin is not included into the purchase.